In partnership with NAFSA: Association of International Educators and Partners of the Americas, Vice President Joe Biden and Secretary of State John Kerry officially launched the 100,000 Strong in the Americas initiative on Friday, January 17, 2014 at the U.S. State Department in Washington, DC. The goal of 100,000 Strong in the Americas, President Obama's signature education initiative in the Western Hemisphere, is to increase the number of U.S. students studying in Latin America and the Caribbean to 100,000, and the number of Latin American and Caribbean students studying in the United States to 100,000. As President Obama said in a speech in Mexico City last year, "When we study together and we learn together; we work together and we prosper together." President Obama's remarks were echoed at the State Department on Friday. "This is the stuff of which close ties are made. The stuff of which economic growth is cemented," said Vice President Biden on international education. He went on to reference NAFSA's economic analysis: "And by the way, international students add, just students coming here, add $24 billion to the U.S. economy. And American students going south will add billions of dollars to the economy of those countries as well." 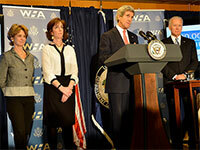 "Education is the great equalizer of the 21st century," said Secretary Kerry. "You have no idea how many people you meet, when I go around the world representing the country and meet a foreign minister, environment minister, finance minister, prime minister, president, who with pride talk about their time in the United States at one college or another or graduate school and what it has meant to shaping their views….studying abroad, in the United States, helped them succeed in a much more internationalized world." Secretary Kerry recognized the State Department's partnership with NAFSA and Partners of the Americas to create the 100,000 Strong in the Americas Innovation Fund to mobilize resources for the initiative, with a goal of raising millions of dollars in private sector investment. The Fund's focus is to create incentives for higher education institutions to overcome barriers and bring about wholesale, systemic change in how study abroad is administered in the Americas. 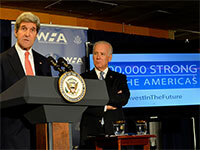 "100,000 Strong isn't just another U.S. government scholarship program," said Vice President Biden. "We already have major and successful international scholarship programs like Fulbright, access grants, and others. We're trying to do here is create something more…We're trying to create a synergy. A new synergy with private sectors, charities, universities, and all the governments in the hemisphere, to invest in sending students to and from the United States, to lower the financial and logistical and language and informational barriers that now stand in the way." NAFSA Executive Director and CEO Marlene M. Johnson said: "The generous support of the private sector means we will be able to offer challenge grants to universities and colleges to make study abroad in Latin America more accessible to all students, not just the few who currently benefit from a global education. Our goal is to reach a tipping point when most graduates can expect to spend part of their college experience learning and working in another culture and another language, making our entire region's opportunities stronger as a result." At the time of the launch, more than $3.6 million was already raised, thanks to founding Donors Santander Universities, a Division of Santander Bank, and the ExxonMobil Foundation, and Contributing Partners The Coca-Cola Foundation, the Freeport-McMoRan Copper & Gold Foundation, and the Ford Foundation. The U.S. Department of State is supporting 100,000 Strong in the Americas with a capacity-building grant. Each will leverage strategic partnerships with institutions in Chile and Peru to expand study abroad. Up to ten more grants to Latin American institutions will be announced in the coming weeks. Find out more about the 100,000 Strong in the Americas initiative and the Innovation Fund at www.100kstrongamericas.org. Read more about NAFSA's work on study abroad at www.nafsa.org/studyabroad.